Swarms of robots acting together to carry out jobs could provide new opportunities for humans to harness the power of machines. 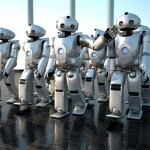 This video shows clips from the IROS 2011 robot exhibition in San Francisco. A 100 kilobot robots travelled from Boston to California; the demonstration shows the robots performing a simple diffusive behavior, where they move randomly so long as they can hear neighbors but stop if they no longer hear the swarm. Aerial robotics research has brought us flapping hummingbirds, seagulls,bumblebees, and dragonflies. 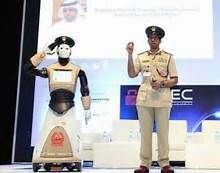 But if these robots are to do anything more than bear a passing resemblance to their animal models, there is one thing they’ll definitely need: better vision. The US already has thousands of military robots and unmanned aircraft in Afghanistan. As for the prospect of killer robots stalking the battlefield Russia is catching up, with a Russian team building one too. (Phys.org) — Engineers should stop working on killer robots and kick the habit of military funding, a leading Australian applied ethicist has said.